… and my computer problems are over, hopefully for good. Don't ask... even I don't understand how or what I did to resolve the issues. I came close to hiring several high school sophomores, (fellow classmates of my granddaughter, who confidently professed they collectively would be able to resolve the issues), but miraculously, when I fired up my desktop antique two days ago, I was able to access the Internet, my e-mail account, and everything else I attempted to open. Oh happy days!!! A seasonal table topper is done! This 36 inch square topper will forever be known as my Thread Head topper since the blocks used were part of a sew along tutorial I participated in (back in 2012), presented by blogger Joanne at Thread Head. joanne-threadhead.blogspot.com (More details posted on my blog on 9/10/2018). The top picture was quickly snapped indoors when a few rays of sun finally peeked through the window blinds, showing the true colors of the fabrics used. A few minutes later I snapped the bottom picture on my patio before the sun rays disappeared behind the gray clouds that were sharing space with patches of blue sky. It was a quick photo shoot... early morning brisk temps dictated it so! Once again my quilter did a beautiful job of overall stippling, because that is what I wanted for this quilt. With the variation of block designs, I felt the quilting needed to unify them together, and stippling was exactly what I had in mind. Thank you, Aimee... I absolutely love the results! I used solid black fabric for the binding, framing the blocks and simple gold border. This will grace my farmhouse kitchen table through the month of November, with special notoriety on Thanksgiving Day. October is flying by and before you know it the Halloween decorations will soon be dismantled and packed away for another year. Here's are a few pictures of my farmhouse kitchen table display in honor of October 31st! The embroidered mini-quilt is a Buttermilk Basin design, made in 2003. I added the fabric borders to the embroidery in 2016. HALLOWEEN is a Blackbird Design cross stitch pattern found in their book, Casting A Spell. The cross-stitched large eyed black cat, and "31" mini pillow are designs from The Scarlett House. The witch and owl/moon mini's are from Boo Moon, by Prairie Schooler. The Halloween fence fabric postcard was gifted to me in 2012 by a dear friend. Most precious of all is the origami black cat made from construction paper by my granddaughter when she was 10, gifted to me in 2012. I added the tape for preservation purposes. And the 5" muslin mummy was a group project at a Minnesota quilt retreat in 2004. I've kept the display on my living room coffee table geared towards the autumn season. I won't be ready to part with it until after Thanksgiving. December and everything Christmas will just have to wait until... well, December! My house, my rules! Until next time... happy stitching and/or sewing! I have been having MAJOR issues ever since installing Windows 10 on my computer. Accessing my own blog so I can post is like a game of chance... sometimes it works, sometimes not. I usually have to shut down and start up about 4 times before I'm allowed access. And getting help from the Microsoft Support team has been next to impossible. So, while I'm here at last, on my own page, I'll give it a go! It was high time I spent a day (or two) "finishing" numerous counted cross-stitch projects. I have at least a dozen more than two dozen designs that are completed as far as the cross-stitching is concerned, but remain in a "flimsy" stage, to borrow a quilting term. I don't frame the small designs, especially if they are seasonal... I'm too cheap to spend lots of $$$ on something that will be displayed for just 2-3 months. So I usually make mini pillows that can be grouped together on my sofa table, or in a wooden bowl that graces my farmhouse kitchen table. It's easier to change out what goes in the bowl than rearranging a wall of framed mini designs... well, it is for me anyway. one strand over one thread, using DMC floss. Mini dot pompoms from Lady Dot Creates. Autumn Splendor, a pinkeep companion from With Thy Needle & Thread designs. Stitched on 36ct. linen, one strand over two threads. The linen was in my scrap pieces... all I know is it's 36ct. is from Lady Dot Creates. Gentle Arts Sampler threads. Medium orange rickrack from Lady Dot Creates. is stitched between the two flowers on the pattern. DMC floss. two threads, using Gentle Arts threads. I was happily sewing the last of the four seams to the companion piece of the turkey shown above, when the thread in my machine jammed, and jammed, and jammed again. I shut it down and walked away, as I could feel my blood pressure rising... perhaps tomorrow??? My luck with technology isn't the best as of late. I had a great visit with family on my recent trip to my home state of Wisconsin. My younger brother and I spent a day walking the wooded acres my parents purchased many years ago in central Wisconsin, and visited the lake where many happy childhood memories still live. My uncle had a tiny cottage on that lake, and I still visit it in my mind with my eyes closed, and a smile on my face. So many happy times! The cottage is no longer, replaced with a year round home that seems oversized among the birch and pine trees. I'm happy for the new property owners, so long as I can keep visiting this summer sanctuary in my mind. My sister and I enjoyed the time we spent at Lambeau Field, yelling, screaming, and cheering on the Packers, in the company of 80,000+ other friendly, fanatic Packer fans! It was my first overtime game, and although I would have hoped for a win instead of a tie, I wouldn't trade the experience for anything! A great NFL rivalry... Green Bay Packers and Minnesota Vikings! I didn't visit any quilt shops in my days away... rather proud too! Because I don't need anything, and if I stop, I know I would shop! There are plenty of patterns and fat quarters filling the shelves in my sewing room closet, each of them begging for place on the cutting table! Until next time, happy stitchin' and sewing to all of you! … since I pieced together my first block for a Quilt Along hosted by a fellow blogger. first ever Quilt Along, hosted by blogger Joanne at Thread Head. 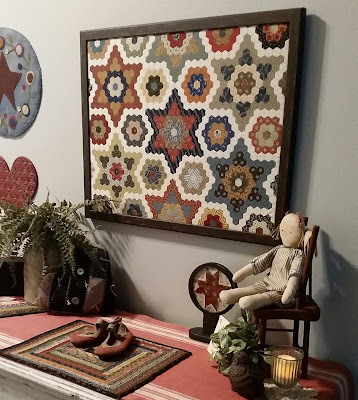 At that time my goal was to make 9 blocks so I would end up with a 38" wallhanging/tabletopper. I was worried about time constraints, and evidently I felt 9 blocks would be my limit. By November of 2012, because I was enjoying Joanne's awesome block construction instructions, and I was pleased with my progress, I decided to increase the block total to 16. (How ambitious!!!) Scrolling through previous posts, it doesn't appear that I ever blogged about these lovelies again. They were stored in a basket along with all the fabrics I had selected and used, plus a few matching fat quarters I thought would work with what I had, just in case I wanted to make more. I purchased the backing fabric at a quilt shop in Hayward, MN, on a trip back home to Iowa, from the annual Threads fall retreat in Hackensack, MN. That was in September, 2013. Apparently, my concern about time constraints was spot on, because these blocks didn't see the light of day until this past January. Snatched off the shelves of my quilt/sewing room closet upon retirement this past December, it was the first unfinished project I wanted to tackle. I sashed the blocks with different black fabric prints, and alternated cornerstones with rusty red and gold prints. Won't this work well all the way through to Thanksgiving? I'm doing a happy dance. Retirement has allowed me to rediscover my love of counted cross-stitch. I especially like stitching on linen, 36 or 40ct... provided I have my cheaters hanging on the tip of my nose, and my Ott light is illuminating like none other. Pumpkins and Bittersweet, design by The Scarlett House. Stitched on 36ct linen, two strands of floss over two threads, except "Bittersweet," which is stitched using one strand of floss over one thread. while my Dad gently loaded our pickings in the rear of the station wagon. Blogger is giving me griefs with this post... I started at 6:30pm, and have walked away several times because of frustration. So I'm going to quit while it's going good. (It's approaching 11pm.) Making a quick road trip to visit siblings in Wisconsin this coming weekend. Plans include sitting (probably more standing than sitting) in Lambeau Field Sunday afternoon, to watch the Packers and Vikings duke it out for division 1st place bragging rights. The Packer organization should consider providing oxygen tanks to those fanatic Green Bay fans that cannot simply rely on their blood pressure pills to control the range of emotional stress experienced at any given game... guess I'll pack a brown paper lunch sack, just in case! It's been a long time... over three years. After much consideration, and encouraging words from family, friends, fellow bloggers, and in particular a cousin who lives in Maryland, (you know who you are, Barb) I'm going to blog again, about the simple pleasures of piecing fabric scraps into small quilts, and other fabric wonders. I'm still addicted to mini quilts... mostly because I lack the patience for large projects. There have been a few changes since I last slapped away at my keyboard, preparing a post... the two biggest being, I moved, but still in central Iowa, staying close to my daughter and son and their spouses, grandchildren, quilting peeps, and non-crafting friends alike. I travel back to my home state of Wisconsin as often as I can. It still has a strong pull on my heart. And, I retired! But that doesn't necessarily mean I have more time... I've just found more to do! Mini quilts made over the past years grace the entryway to my home. Future posts will also include multiple ramblings and pictures of counted cross stitch projects, as I rediscovered my fancy for putting a different type of needle, and a different type of thread, to a different type of fabric, resulting in mini's of another kind. In truth, I have been cross stitching more than quilting in the past 2 years, and loving every minute of it! When I stopped blogging in 2015, my Stars in the Garden hand sewing project was still in the works. The first 3/8 inch hexies were hand stitched together in January 2014. I'm happy to say it's one project that I finished! Framed in a simple dark wood frame, this hand pieced project was completed in February 2016. Primitive Quilts and Projects magazine, Spring 2013 issue. That's it for my first post in my second-time-around of blogging. It's time for me to blog surf, visit old blogging friends, and discover new ones! Pouring a fresh cup of coffee... heck! I'll just bring the full stainless steel carafe and park it next to my mug, my computer, and me!! !